Picasso and the Painting that Shocked the World is a dynamic biographical portrayal of an intense man during a pivotal era in history. Written around the context of a brutal, energetic, controversial, and untouchable masterpiece, Unger presents Picasso’s as a personality equally as complex as his painting. The painting in question is none other than Les Demoiselles d’Avignon (The Young Ladies of Avignon, originally titled The Brothel of Avignon), 1907 measuring 96 inches by 92 inches. This painting did indeed shock the world from many angles. In addition to being an artist, Picasso was also his own cartographer, forced to forge his own road map for the wild frontier that was his life’s path. He had no equal, no mentor, no pre-established pattern for his career to follow. Raw temperament and unparalleled talent drove his conquests. However, there was a handful of people flowing in and out of his life that sparked inspiration, motivation, and ultimately his success and fame. After an introduction steeped in present-day verbiage nostalgic for a time long gone, Unger succumbs to the sentimental draw and leads the reader back in time. Along with Carles Casagemas, a fellow artist from Barcelona, the reader walks arm in arm with Picasso as he acknowledges the formative influences of his family and in particular, his father, Don José, who was a painter by trade. Death and gloom seem to follow Picasso around, permeating his spirit, making residence of his soul. Loss, tragedy, dreary weather, restlessness, poverty, determination, and above all else, pride, moved Picasso around Spain and into the Paris streets where he separated from his family but not from his roots: Casagemas was eternally bound to Picasso’s psyche. Living among the hovels and tenements of Montmartre he suffered through an existence with a cast of characters including Max Jacobs, a retinue of Spaniards, an entourage of prostitutes, opium dens, philosopher-poets, and of course his mistress Fernande Olivier. With his relationship to Iberian melancholy strong, well fed and deeply ingrained, Picasso delivered paintings that struggled to find buyers. Enter to the scene Henri Matisse and Gertrude Stein, two catalytic characters for the changes in Picasso’s art. Matisse became the artist to beat at the shock-and-stun game whereas Stein was the ring leader for promoting the wily Picasso name and the historical importance of his work. A stylist duel ensued between Matisse and Picasso; between Fauvism and the newly forming perspectives of Cubism. Picasso immersed himself in museums, in Egyptian and African masks and sculptures, in classic studies as well as modern icons such as Cézanne, all the while searching for a way to outdo his rival Matisse. Dealers were pitted against each other as was the Stein family with one falling into either camp Matisse or camp Picasso. It was from this flurry of energetic battle that Picasso landed on the ideas for Les Demoiselles d’Avignon. He withdrew into his studio, a special room procured for this painting alone, where he spent every moment possible performing what Unger refers to as his “Exorcism”—getting the painting to come out of its host. An apt title considering the spiritual and humanitarian depths to which Picasso drove himself in order to meet such a challenge. The results of this painting were even more severe than Picasso could have imagined. Nobody understood what he was trying to achieve. He faced ongoing scrutiny, anger, extremely harsh criticism, and mockery during his painting efforts, in the midst of its showing, and thereafter. Nevertheless, Braque ultimately partnered with Picasso. Together they sorted through the cubist features that would take the world by storm and come to be regarded as a turning point in art history and in Picasso’s fame as the father of modern art. 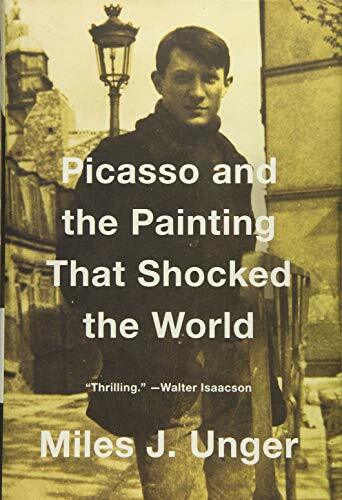 Written in an assured and confident voice, Picasso and the Painting that Shocked the World tells the real and earthy story of a scandalous painting, its unscrupulous painter, and the whirlwind turn of the century European setting in which it all came about, blindsiding people out of their Renaissance stupor.